The cross is today the universal image of Christian belief. Countless generations of artists have turned it into a thing of beauty to be carried in procession or worn as jewelry. To the eyes of the first Christians, it had no beauty. It stood outside too many city walls, decorated only with decaying corpses, as a threat to anyone who defied Rome's authority—including the heretic sect which refused sacrifice to Roman gods. 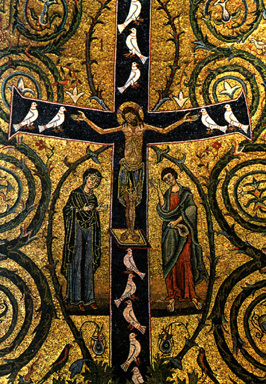 Although believers spoke of the cross as the instrument of salvation, it seldom appeared in Christian art unless disguised as an anchor or the Chi-Rho until after Constantine's edict of toleration. "How splendid the cross of Christ! It brings life, not death; light, not darkness; Paradise, not its loss. It is the wood on which the Lord, like a great warrior, was wounded in hands and feet and side, but healed thereby our wounds. A tree has destroyed us, a tree now brought us life."